Major innovation is not always easy, especially for established industries and businesses. And even when you introduce a major innovation that shakes up your industry or leaps you in front of the competition (i.e. creates a blue ocean); there is usually a follow-on phase of business optimization. 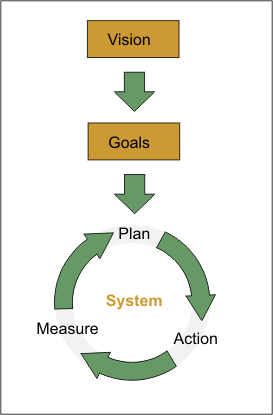 One thing common across all types of business improvement, no action = no results. To manifest your vision and achieve your goals you need to take action; exectute your plan. I really think you need to know where you are heading. What is the big picture vision of what and where your business is going to be in 3 to 10 years out. Most business visions are too big and too far out to be meaningful as day to day working objectives. Goals are your intermediate objectives that you can achieve in a shorter time-frame. They should be specific and measurable. Action (Execution)- Actually perform tasks or actions that move you to completion of the project and the goals. Measure – The only way to know if your project is moving you towards your goals is to measure before and after. Ongoing business processes and business systems can be improved by implementing projects (taking action) or projects can have objectives of their own. Innovation Footnote: If you haven't guessed, a project can introduce an innovation. So really, business optimization is about aligning your business results with your business vision. Innovation or improvement have the same objectives, sometimes the scale is a little different.